I feel really sad to be writing this final post in this wonderful series. I've had so much fun taking part in this project, which challenged bloggers to take more photographs, improve their photography skills and in doing that, improve their blog too. 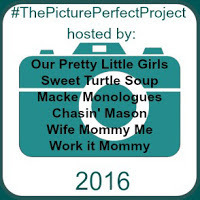 Thank you so much to the lovely ladies who hosted the Picture Perfect Project for letting me take part. It's been a joy. This project has left me with a wonderful record to treasure of a year in the life of our much loved garden.🏡 I'm so grateful for that honeys. It's like having the past year stored inside a little time bubble to re-visit time and again. I had been hoping to have some snow to show you, to bring our little project to a close. A blanket of beautiful snow covering our garden, and we did actually have some snowfall recently. It didn't last though I'm afraid. It fell in late evening and by early next day it was gone. Let's jump right in then shall we honeys? I was so happy with these images and still love them. I was blessed to catch the rain fall on the holly berries. I think there is nothing so perfectly beautiful as nature honeys. So much beauty around us all the time if we just slow down and take the time to notice. That's what I've learned from this past year snapping away behind my camera. March saw the return of Spring and with it some much needed work in our garden. The Roses began to grow, we planted more lavender, the peonies started to wake up and look for the sun to help them grow and on Mother's Day we went shopping and bought the perfect rose shrub to plant in memory of my dear Mother in Law. We planted it exactly one week later not really expecting it to grow roses this year but oh my, it did! It was a joy to watch all of the changes. Every year I smile when I see my dear Gramma's peonies start to push their way through the top soil to say hello and it was so exciting to go out every morning to check for changes in the rose bushes in our tiny front garden. Within weeks the rose bush we'd planted for Mum had started to grow tiny shoots! In May, almost lost in the gorgeous leaves of the peonies, we spotted it! The very first peony bud that would, soon enough, turn into a stunning, perfect, glorious peony! There are no words for how much this darling little tree means to me. It was starved of sunlight, because of the very large trees all around the lane at the back of our home, and has grown leaning to the side in search of sunlight. This has left our little apple tree looking more than a little crooked but I adore it. In June the peonies arrived! Mum's rose bush continued to spout leaves and even started to grow some tiny little roses buds! I was beyond thrilled honeys. I hadn't dared to hope for roses in its first year but this dear little shrub had certainly taken root and was positively thriving in our tiny front garden, so, maybe an actual rose? I so love the raindrops on this perfect rose honeys. It was worth being rained on to catch it in its own tiny time bubble. Remember I mentioned large, full sized apples growing in our garden this year? Aren't they fabulous? We checked on them every day and they got bigger and bigger until they eventually became perfect cooking apples. The tree is a Bramley apple tree, it's fruit is generally regarded as the perfect cooking apples and they so are. Blueberries! So many blueberries this year honeys! We planted the blueberry shrub to be food for the birds who visit our garden and this year there was a bumper crop. I'm thinking about planting another in the Spring if we can. While clipping back the roses in our front garden I was surprised/delighted/very, very chuffed 😄 to discover the most perfect rose (above) hidden, growing all on its own. Such joy! Isn't it perfect? This past September will forever be remembered as the month we lost our beloved sycamore trees. Our local council hired a company who came and cut down the sycamores which lined the lane behind our house. It really did break my heart honeys. We choose this house partially because of those trees. They've always made me feel safe in the sanctuary of our back garden. It doesn't feel safe anymore. I know they'll grow back eventually but it'll be a while. October was the month Hubby took action in the garden! For the past few years storms have caused such carnage in our back garden honeys, at times tearing our very tall fencing right out of the ground! In the hopes of avoiding the same kind of damage, and days of repairs in cold weather too, Hubby spent days taking the original fence down and replacing it with a lovely new one as well as painting it to protect against the elements. November. I dread this time of year honeys, I really do. By now the clocks will have just gone back an hour, vital in Scotland because otherwise it would be even darker than it usually is in the cold winter mornings making it dangerous for people to travel to work and especially so for children going to school. In Scotland it can be dark until after 9am and will get very dark again, not gradually, it's like someone flicks a light switch, before 4pm. Seriously honeys, less than five hours of daylight is a dreadful state of affairs. It's depressing, it drains me of energy while the cold and damp weather try to make my joints turn me into a human pretzel. Goodness how depressing 😩 Enough Rosie moans! Her others are more practical with glow in the dark piping along the edges and lovely fleecey lining to keep her warm on walks. Isn't it beautiful? It didn't last very long though honeys and by next day it had all melted away as if it had never been there. The garden is sleeping now but I can't wait till Spring it wakes again. Thank you so much for keeping me company on this probably far too long trip down memory lane through the past year in the life of our garden. Thank you too to the lovely hosts of the Picture Perfect Project for allowing me to be part of their link up. I've loved every single minute of it!